A Japanese Restaurant on the main Seminyak drag that we happened on by chance, and now it is a must-go. The restaurant is below with a nice and breezy open air bar at the top (where one can also dine). Reasonably priced and fresh sushi,sashimi, tempura and grilled items. The highlight for us was the live Jazz Band on Monday night. AMAZING, and so much fun. Make sure to make a reservation, grab a beer and watch the extremely talented band and their random guest stars (on the night I was there, a local trumpet player, a German rapper, and a NYC drummer) perform some truly great live music. With performances on Monday, Wednesday and Friday, call to check the gigs (or look at their Facebook page), but I hear Monday nights are the best. 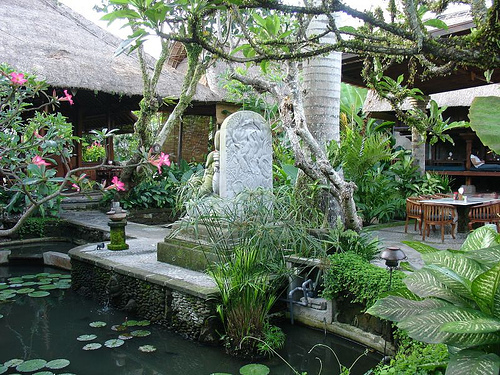 Also has branches in Kuta, Sanur, Ubud. An institution for me, I’ve been going there since I was a kid. The food has gone downhill slightly, but still a great place for local (always my preference) or international food at reasonable prices. The gado gado, Balinese crab, grilled snapper with Balinese sauce, and nasi goring special are all recommended. 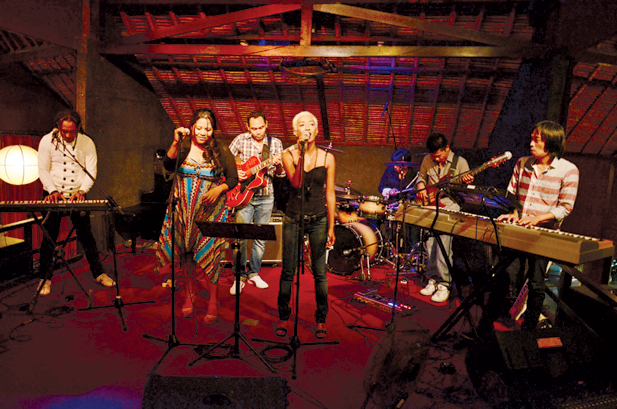 The Legian branch is larger and has live music, the Kuta branch is in the center of it all, but not as big and harder to get a table. A nice, really low key and unassuming place to hang out, grab some either local (apparently the chicken wings and frozen margaritas are amongst the best in Bali) or international food for reasonable prices. A place where local and international surfers hang out, as apparent from their wall of surf pictures. You never know, you may bump into surf royalty there! Enough said…it’s on my list. 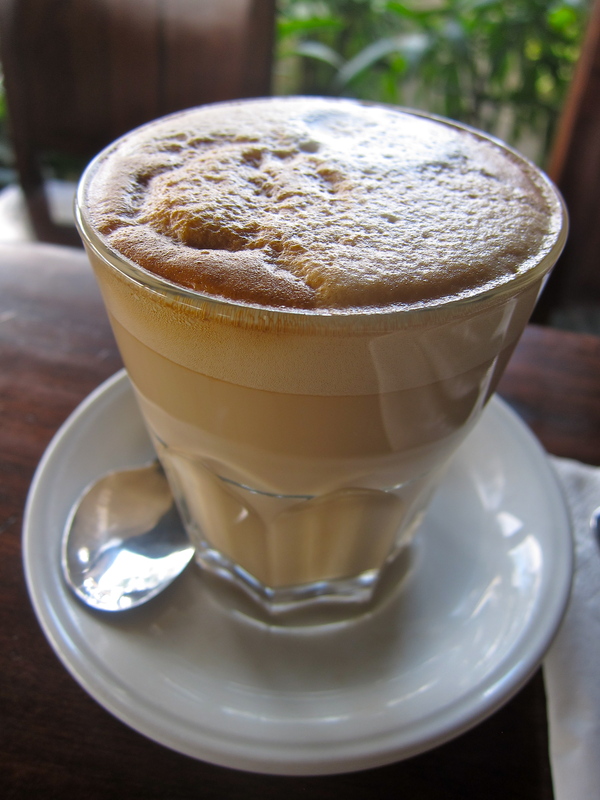 This is one of my favorite food spots in Bali – literally translated as “Café Cheap”! It’s a no-frills, no-effort-for-presentation-and-decor place, a street-side café that serves curry in stainless steel buffet palettes, with a smile. Sit alongside surfers, local expats, and various other tourists with a beer and plate piled high with whatever you choose to eat. Food is charged according to what you select – IDR20,000 (HK$16) for a piece of ayam goreng (fried chicken), to IDR 2,000 (HK$2) for an extra portion of rice. You’ll end up with whole pile of yellow food tickets on your table and a VERY happy belly. It may not look pristine clean, but don’t worry – there’s no risk of Bali belly here! Double 6’s answer to KDT, a cool trendy place to hang out after a day on the beach. Order a cocktail (IDR 90,000) and you can have use of their swimming pool (so nice after a day of sea water and sand!) There’s a restaurant attached as well, haven’t tried the food yet. Deus is a brand/motorcyle culture that hails from Australia, focusing on custom parts, and hand-built or restored motorcycles, and surfboards. The store in Canggu oozes COOL, and encourages daydreams of flying down a quiet road on a truly beautiful piece of machinery. Once you’re done daydreaming, you can browse some of their COOL clothing range and surf/bike art and memorabilia, or sit down in their cafe where they serve a mean full breakfast and supposedly one of the best coffees in town. If you’re interested, you can take a peek around the back of the courtyard where they’re workshops are, you might catch them shaping a board or restoring a motorbike. If you fancy some live music, give them a call to ask when their next gig is – they play on the grass in the courtyard, under the stars. A great place to watch the sunset right on the beach and have a BBQ. 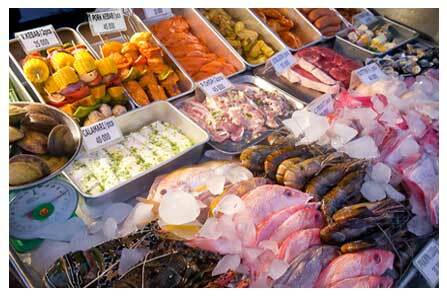 Choose what you want from a large selection of seafood and meat, and they will cook it for you. You’re charged according to the food you select, and then help yourself to a buffet selection of salads and rice. There’s live music every Sunday night (no reservations on Sunday). 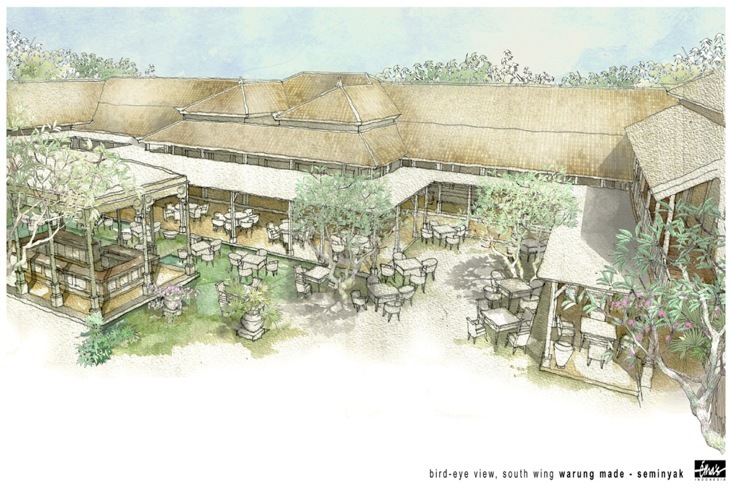 A2013 new addition to the Canggu agrea, this French boulangerie/patisserie is bound to be a huge success! Run by two French guys, Greg and Rafi, who are so, so nice – they have the crispiest croissants (I’m sure in Bali weather, this is a challenge! 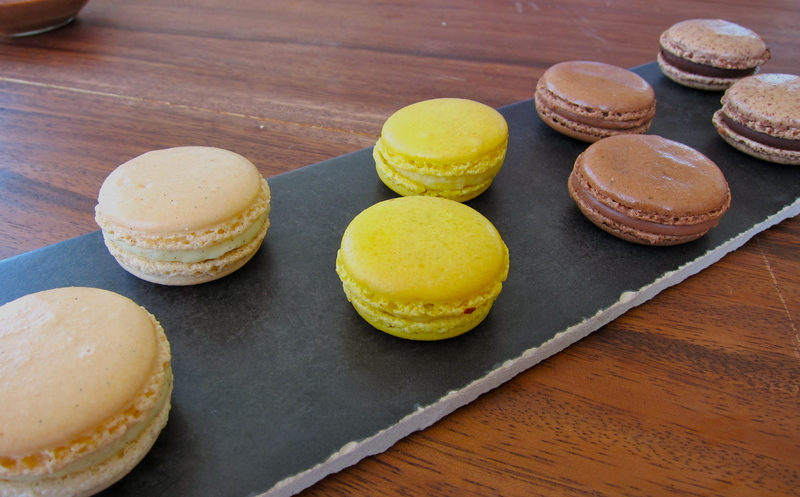 ), the moistest and most flavour-packed macaroons (made with all natural ingredients), and cakes that make you go ooooooooooooooh. I am not exaggerating here. We came here to look at wedding cakes, and the way things are going, we’re just gonna scrap dinner and just serve cake! 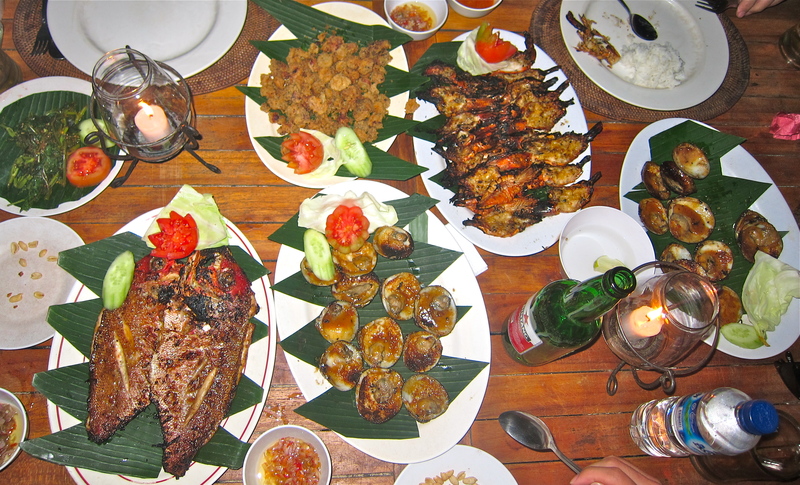 After years of being recommended to visit sub-par, expensive and disappointing seafood one after the other on Jimbaran Beach, we were finally directly to Manega by a Bali local, and have never looked back! This place is a gem, a diamond in the rough. 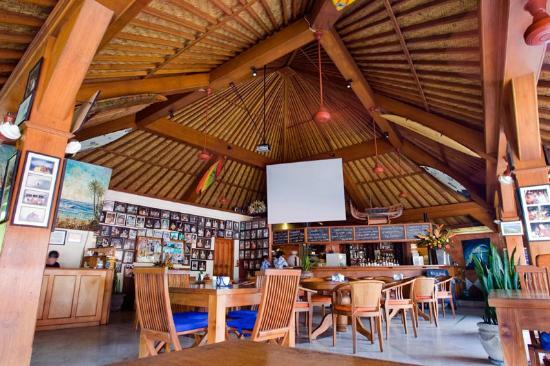 You would think that the fact that this restaurant has been an unfortunate victim of a Bali bomb would deter people, but it just attracts more people to it. They are packed to the gills (no pun intended) every night so their seafood is guaranteed fresh! We don’t even bother looking at the menu, we just pick our seafood from the tanks and wait for it to be cooked. A dinner for 5-6 usually costs us IDR 800,000 (HK$650). Our table before we attack! A few words of caution: Reservations are ESSENTIAL! Make sure you ask for a table as close to the waves as possible. Coconut husks are used to feed the grills, and they produce the most insane amounts of smoke – not good when you’re trying to enjoy your meal. Get there EARLY! Arrive and order before the throngs arrive, or you will be waiting for your meal for an hour or more. Order your beers in MULTIPLES! The waitstaff are inundated and you might wait a while for those too. ORDER LOTS OF CLAMS! They are like heaven in a half shell, with this gorgeous secret BBQ sauce that is so moreish. 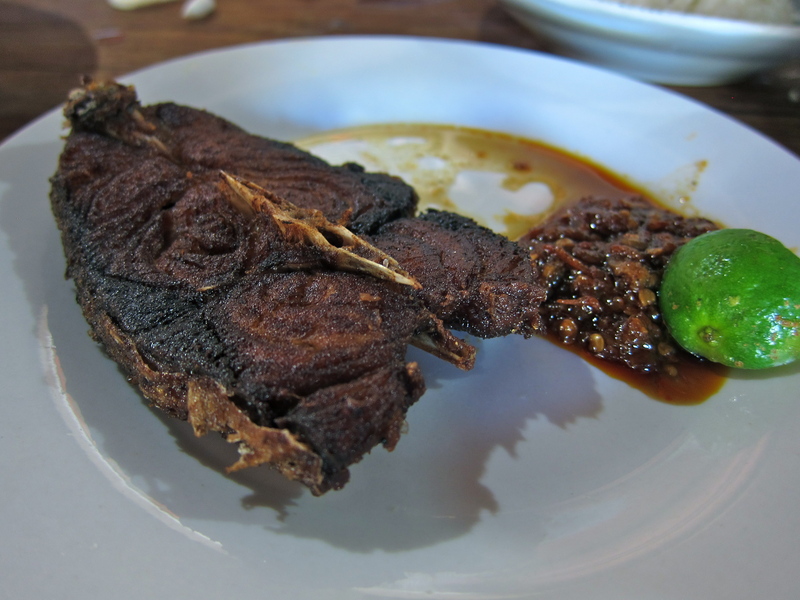 Oh, and I could eat BOWLS of their sambal matah – a lovely chili sauce with shallots, shrimp paste, salt and lemongrass. A local expat we met who can’t be bothered with the popularity of Manega has recommended the next door Teba Café instead. Apparently the food is comparable, and it’s not as busy. Another small, grubby warung that specialises in fried ‘ikan laut’, or a type of marine fish. It is famous amongst Indonesian locals and serves one thing, and one thing only – fried fish with fish & winter melon soup and rice. The chili sauce that is loaded onto your place is explosive, but you just can’t stop eating it. Use your hands! The Es Jeruk (iced fresh orange juice) is particularly nice here. Finn’s is located within the Semara Uluwatu, a luxury cliff-side villa complex. 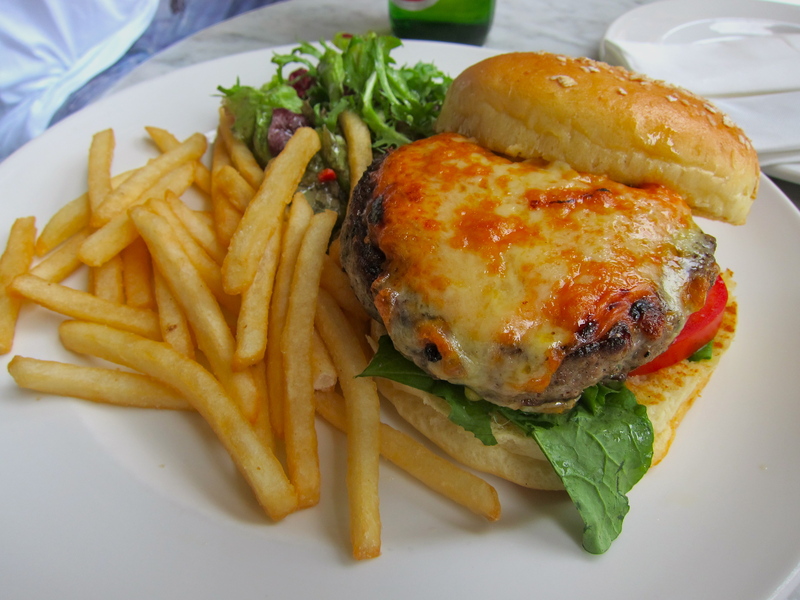 Even if you aren’t staying at the hotel, you can take the hotel cable car down to the beach below, and feast on pizzas, grilled seafood or sandwiches (steak sandwich, burgers etc. 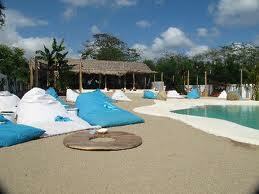 ), or chill on one of the sun loungers. The sand there is some of the whitest and finest that you will see in Bali. Prices are in the vicinity of IDR 170,000 per dish (HK$140). 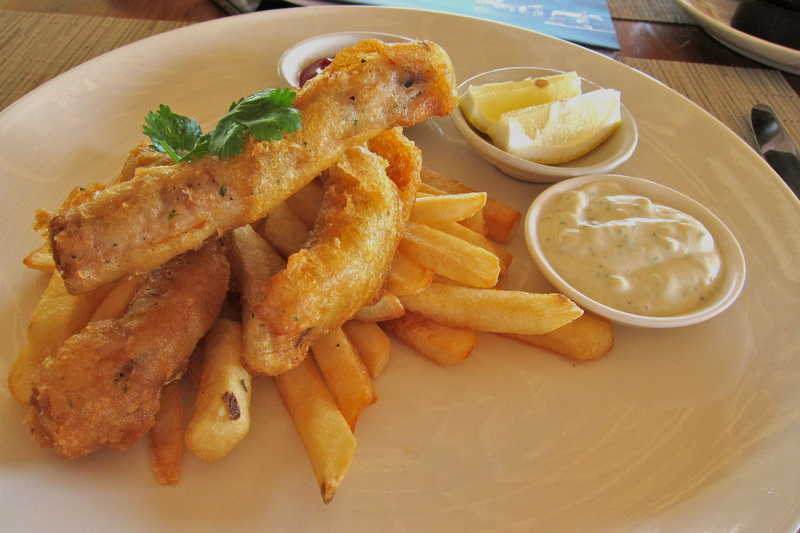 The fish and chips isn’t on the menu, but I asked as a special order. I haven’t been here yet, but it is top of my list of places to try the next time I’m in Bali. Cliff-side dining, sunset drinks on blue and white “bean bags next to a white rock pool”, super-authentic paella – what I’ve heard sounds right up my alley. Even if you’re not staying in Uluwatu, it still sounds like it’s worth a trip there. This place serves one thing and one thing only: simply the best babi guling (roast suckling pig) in town. It’s an institution. Order their special plate complete with a wonderful green bean salad, fried pork, blood sausage and rice. Make sure you go early, they only roast a certain number of piggies for lunch and dinner, and once it’s finished, they’re finished. Es Jeruk (iced orange juice) is really great here, but ask for less sugar if you’re adverse to super-sweet. A lot of people order whole suckling pigs from here for special occasions, weddings etc. No reservations. 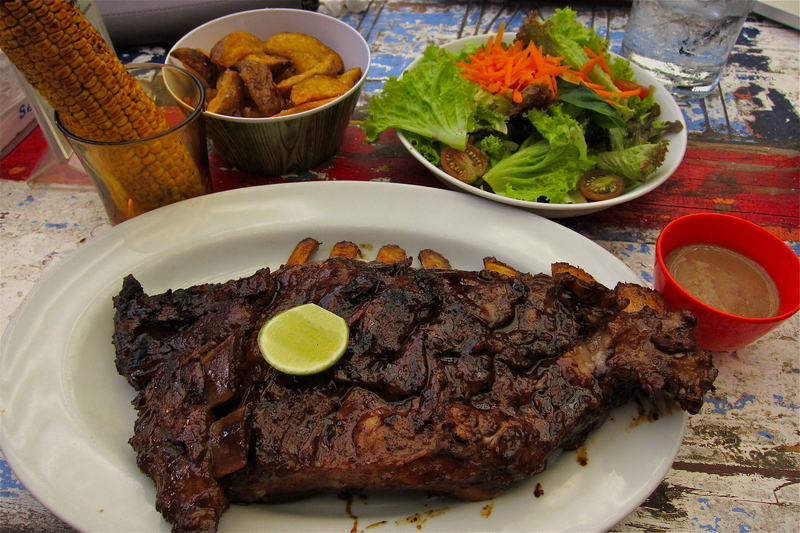 There are two locations, one right off the main Ubud street, open for lunch until 2 or 3pm, or until the pig runs out! Another location is closer to the Bali Zoo. If you plan on making a day trip to the zoo, then the other location is more well-situated. Literally translated as “The Dirty Duck”, BB serves Balinese smoked and fried duck and all sorts of duck. The whole menu is dedicated to this quacking fowl, and I can’t imagine a more serene place to eat lunch in Ubud, on a raised hut with a view over the rice paddies. This, is Bali. Bali Deli is exactly that – a deli in Bali that stocks most of what you would need to cook your own Western or Indonesian meal in Bali. They stock imported meat and seafood, international spirits and beers, as well as a pretty good bakery. You can also order lunch and coffee on their terrace before shopping, if you need to prepare yourself for the task. This is a huge supermarket conveniently located on Jalan Raya Seminyak – they’ll sell everything you need. Open daily 10am-10pm. ENJOY! I would love your feedback below if you like my recommendations! 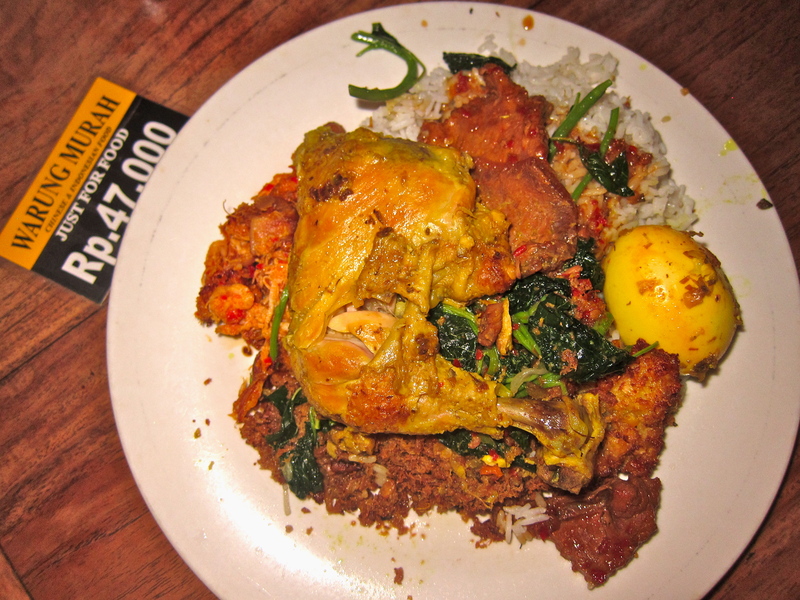 Nasi Padang: Originated from Padang where most of the food involved coconut milk and heavy taste of chili. 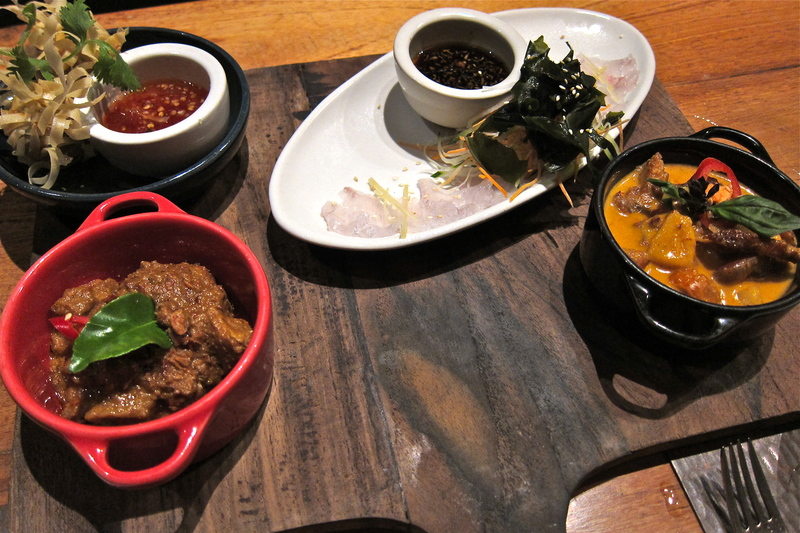 very wide selection of small side dishes, kind of like Indonesian tapas. Nasi Goreng: Fried rice with eggs, chicken/beef/shrimp, assorted vegetables, flavoured with kecap manis (sweet soy sauce). 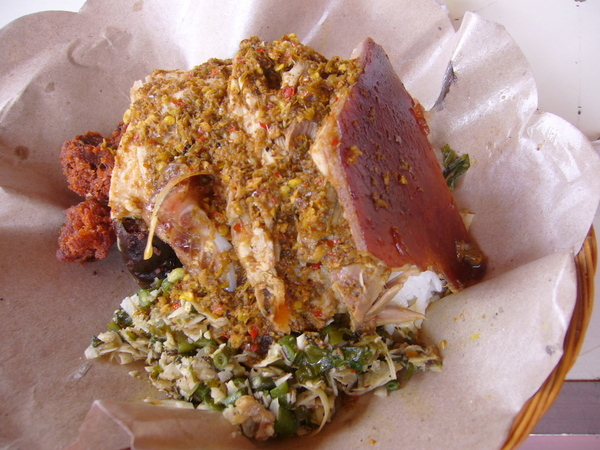 Nasi Bunkus: Takeaway rice in wax paper, served with a selection of dishes. Nasi Campur: Rice with assorted vegetables, satay, and meat of choice. Laksa: A coconut milk-based vegetable soup, served with vermicelli noodles, beansprouts, and sometimes prawn. Es Jeruk: Fresh orange juice on ice, usually with water and sugar added. Jeruk is a local type of orange, smaller and with a green skin. It has a specific taste that is very different from a regular orange. Hi Jenny, I like your new mixture of food and travel. 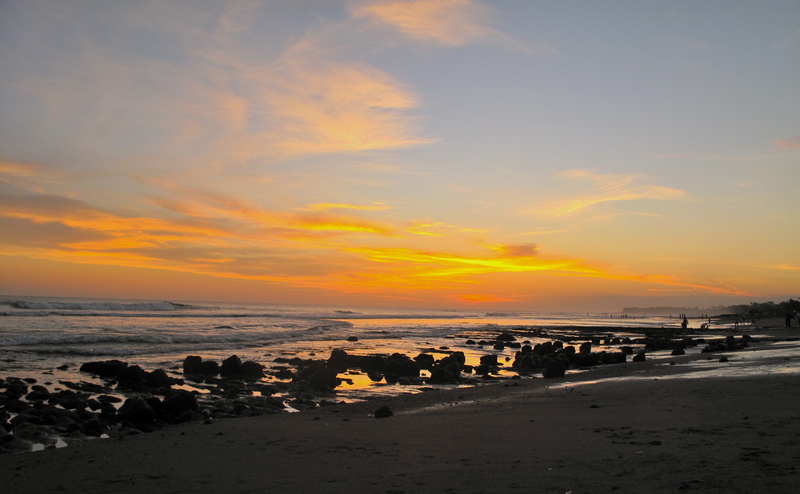 I enjoyed Bali too – great food and interesting Hindu culture. A friend of mine went up into the mountains to photograph skulls left by cannibal tribes, but maybe that’s a unsuitable topic for a food blog! So good dude!! Really enjoyed reading it. You ARE the food expert on Bali!! Holy Moly! My tummy is rumbling for some babi guling! AH of all the great food in the Bay Area we have yet to find THE Indo food spot!! 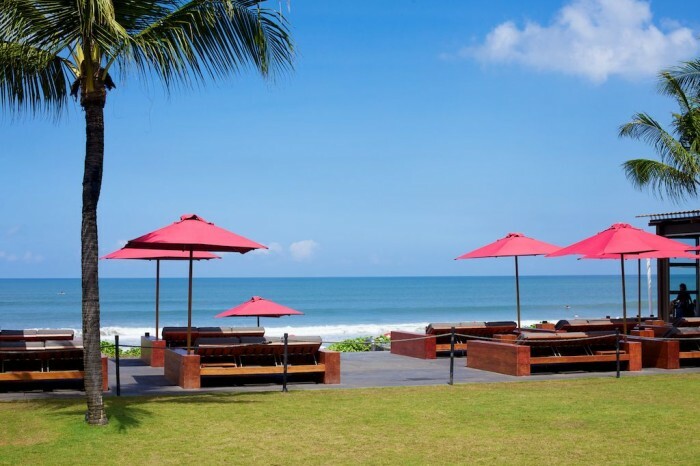 @ Peri, thanks for your comment – Bali is such a beautiful place and I would recommend it to one and to all! I love reading your blog! he… i am from Bali. Thanks to visit my place.